Vida began her journey of exploration against the backdrop of the social and cultural upheaval of the 1960s, where rebellion, androgyny and gender variance challenged traditional notions of identity. 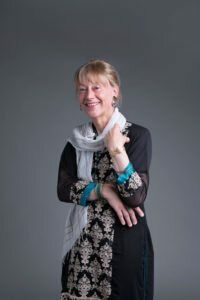 Vida’s experiences were shaped by a mixture of social encounters and her own inquisitive nature, from the progressive scene in Manchester to the inclusive and spiritual values of Mevlevi Sufism. “I was drawn to Manchester Concord (a social club for trans people) and I remember having a real sense that I’d found a home, and through meeting people I had found a place for myself in a community, in my community. Now I feel like I’ve found two places to be myself, I’ve found two homes, and there is a connection between the two. We’re on a path together, on a spiritual journey and we’re all at different points. For me it’s important that I’m with fellow travellers. I’ve come to really appreciate the importance of having a process or ceremony, with other people. The idea of evolving an image of myself that would reflect my beyond-the-binary gender personality is coupled with my interfaith desire creating ‘Vida’ in a different mode. So in a way it was a very creative process that I’d gone through and that I’m continuing to go through, and what’s exciting is that it will develop and reach a point where hopefully I’m comfortable in the world, within my faith group, to express my faith and convictions as Vida.